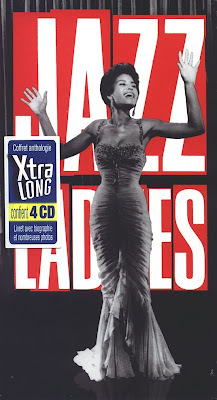 Jazz Station - Arnaldo DeSouteiro's Blog (Jazz, Bossa & Beyond): Box Set of the Day - "Jazz Ladies"
Liner notes by Philippe Blanchet & Sandy Scott. "The breakdown of boundaries between different musical genres at the turn of the last century, modified the rules of jazz. Open to influences of all kinds, jazz has welcomed music from the world over, enriching itself with new color, seeking out new ideas. Once again the female vocalists are leading protagonists of this metamorphosis. Some, like the Canadian Barbara Lewis, are exploring paths to a "new world fusion". Others, following in Flora Purim's footsteps, like the young virtuoso Brazilian singer Ithamara Koorax, blend samba-infused jazz with the electronic clicks of frenetic drum & bass. The tempo is changing. The instruments change too, sometimes. But the voice, the voice of the diva which instills jazz with a vital charge of "soul", seems more indispensable than ever..."
Teri Thornton – What’s New?